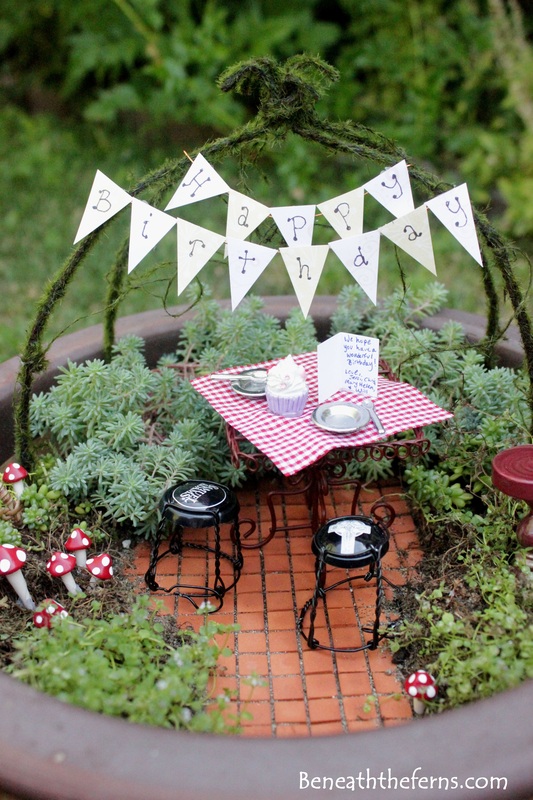 Here is my entry #3, a birthday inspired fairy garden I made for my mom. 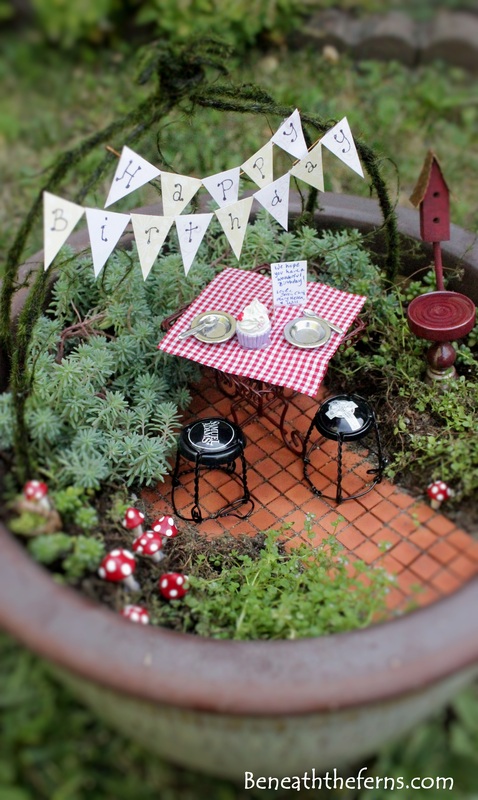 We don’t live as close to each other as we used to, so I made a little “picnic” table where our fairies can sit together and share a giant birthday cupcake! 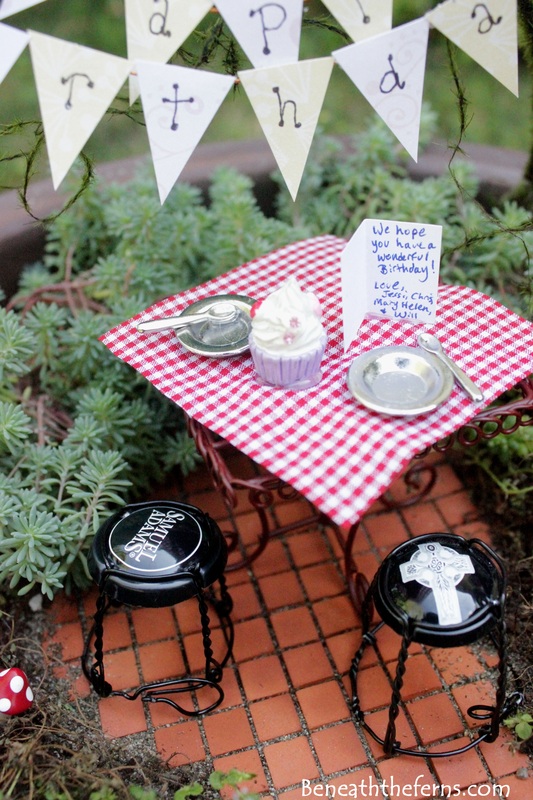 The chairs are made from the tops of really expensive beers that my hubby drank… And there is even a miniature card for her. 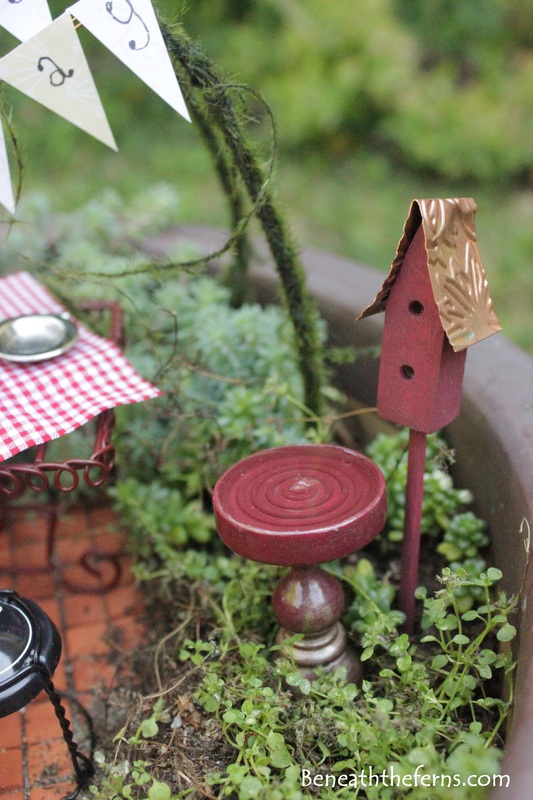 I made a matching birdhouse and birdbath, I love how the copper roof on the birdhouse looks! The plants I put in here had a bald patch, so I filled in the area with some little mushrooms! Up first are some amazing nautical doors created by the talented hands of Alicia at MiniWhimsies. I couldn’t decide which door I liked better, so I had to include them both! Alicia has an amazing vision, and makes her doors fit seamlessly with her theme. Next are some adorable little flip-flops and a woven basket created by Plamena at Plad. Plamena’s work has been a favorite of mine for many years… and these little beauties look soft and whimsical, like a perfect day at the beach! And what day at the beach is complete without a little something cold and bubbly? Pam from Landscapes in Miniature has provided the refreshments today with a little bottle of champagne in a bucket of ice. These charming bedrolls were made by Pam at BitsandpiecesbyPam. They look like a sleeping bag I had when I camped out as a kid! Here is another gorgeous little piece that has been in my favorite box on Etsy for years… Orly from Orlydesign has captured the misty feel of the coast in her little house just perfectly! And finally, this little lighthouse and boat are just too cute! 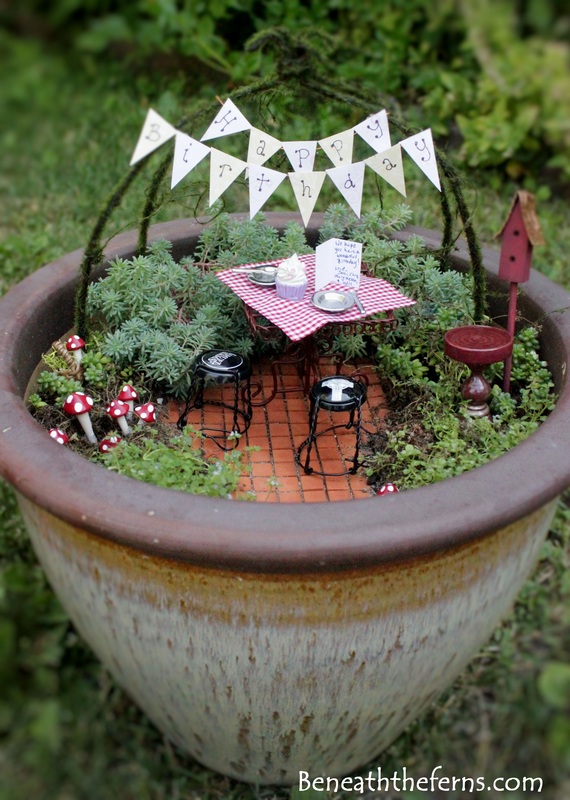 They are perfect by themselves, or add them to a fairy garden… Edna from Ednapio has created a sweet little pair here! Maybe I just love the beach because I grew up in the midwest, and only had the Great Lakes to look at.. I could imagine what the “real” ocean looked like, and always told myself I’d go there. Well now I’m a west-coaster, and all these beautiful fairy garden accessories sum up the beach experience for me: sand, water, and a touch of magic! Thanks for looking, and remember to click on those pictures if you want to learn more about each item! Baby fairies in the garden! Tania from Fairy Shadow makes these adorable little Waldorf-inspired fairies, complete with a felt leaf to hide in! I love the tiny antennae and all the details in the leaves! Garnett over at Garnetth makes little wee ones that are so natural, they look like something you might find if you start looking under all the leaves in your fairy garden! I love how Agnes at Sacred Jewel matched tiny little wings with this sleeping fairy! The colors are so soft and muted, they fit right in with the milkweed cradle! This sweetie looks like her wings are drying out, and when she wakes up, she might just be ready to explore her world! Paula at Trilliants makes amazingly realistic fairy figurines!